coordinating persons who are 60+ and their spouses, with emphasis on frail, minority and low income citizens from Somervell County. 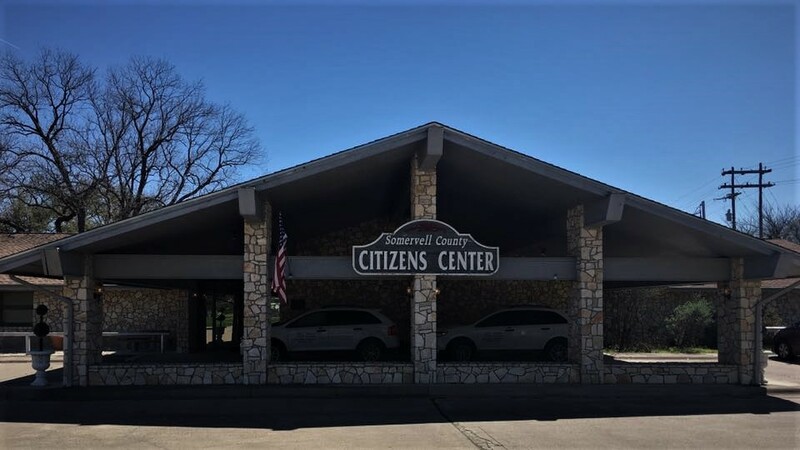 Somervell County Committee on Aging coordinates services for persons who are 60+ and their spouses, with emphasis on frail, minority and low income citizens from Somervell County. 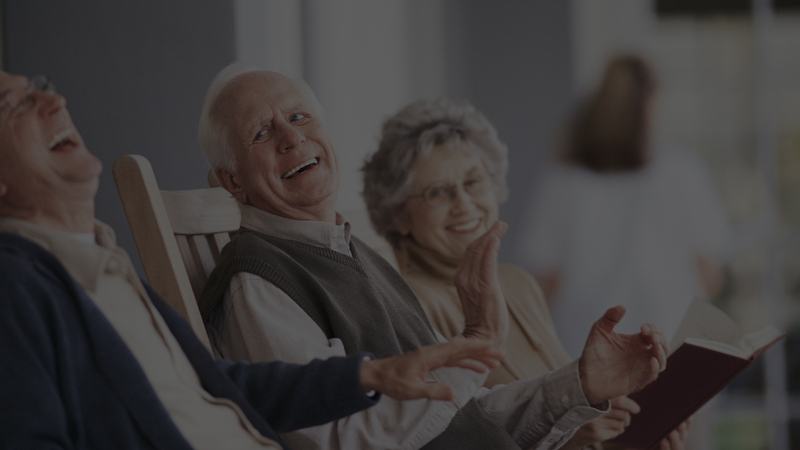 The Center is also a resource for the entire Community, regardless of age, providing services and information on aging, and assisting family and friends who care for older adults. 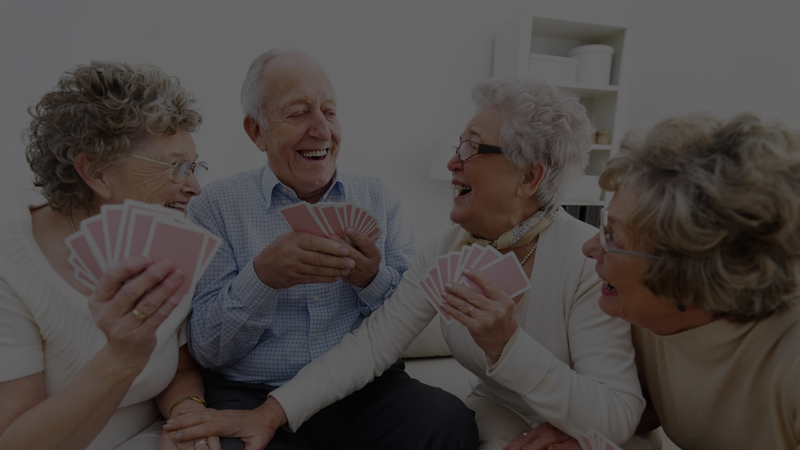 The programs provided give the opportunity for older individuals to maintain independence in their own homes through involvement in Senior Center activities and a variety of services provided by the SCCOA. 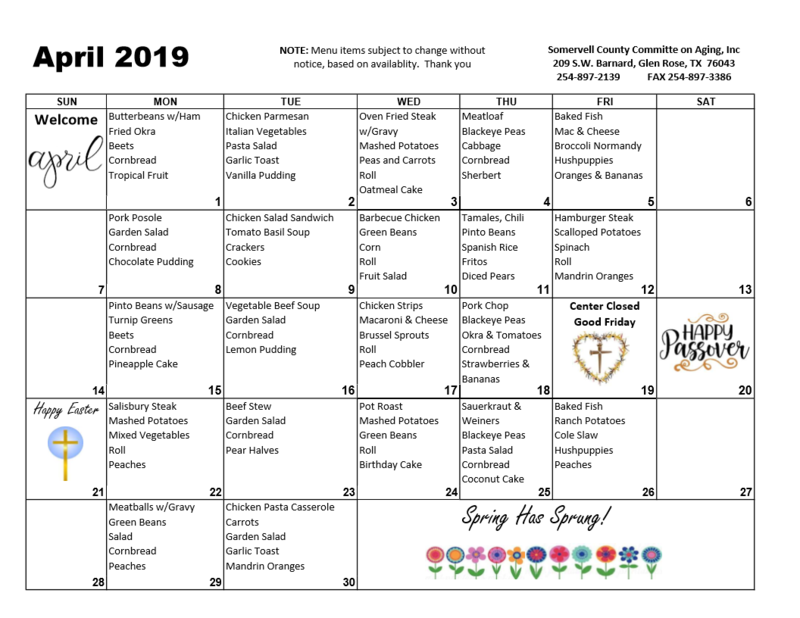 Services provided include meals on wheels, transportation services, fresh cooked,hot nutritional meals Monday thru Friday served at noon in our Dining Room. Call before 10 AM to reserve your meal, (Click Here for Pricing). We also offer emergency response service, health screenings, and educational programs. Activities scheduled at the Center include weekly grocery shopping, Dollar General, Bingo Monday, Wednesday and Friday, “42” daily and tournaments twice a month. Once each month they host Bluegrass, Gospel Music, Birthday Celebration, Dances and a trip to Wal-Mart. 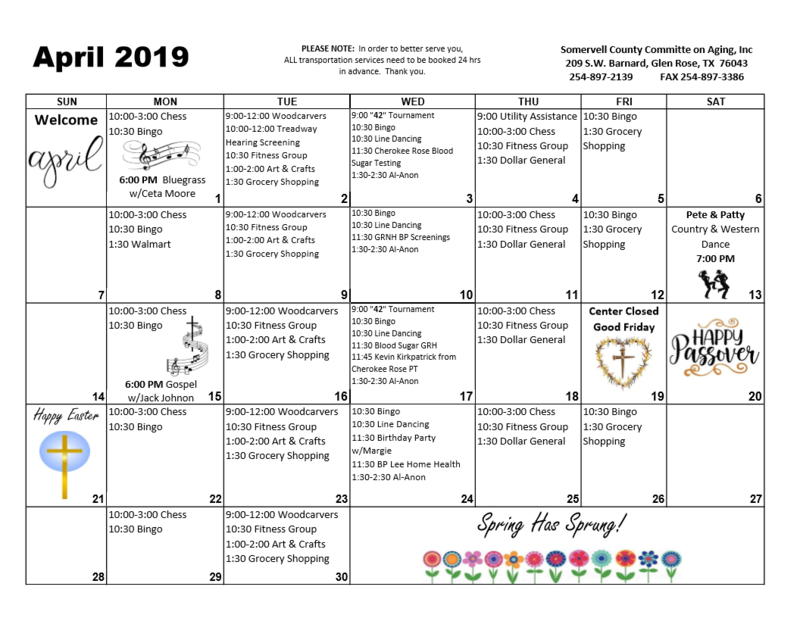 Other activities include craft/art classes, exercise room/classes, library, chess, and puzzles, call or click links below for schedules and details. There are other numerous programs scheduled throughout the year such as Flu Shots, Older Texan Day, Volunteer Appreciation Day, majority of holidays have activities planned. We would love to visit with you and answer any questions you might have. Monday, November 5, 2018 at 6 PM – 9 PM Come join us this and every first Monday of the Month for some good time old Bluegrass and Gospel Music. Featuring Ceta Moore and friends. Bring an instrument to join in or just sing a song. Also bring you favorite dish to join in the pot luck dinner break at 7 pm. Saturday, November 10, 2018 at 7 PM – 9:30 PM Come and join Grant for some good time Country Dancing. Bring a dish to share if you like. Cover is only $5. Monday November 19, 2018 at 6 PM – 9 PM Come join Jack Johnson and friends for some good old timey Gospel Music and home cookin’ Guests are welcome to bring instruments or a song to sing and a dish to share. Our regular craft class has been moved to Thursday at 1pm this week. Ima will be making "Bunny Race Cars" made with Twinkies and Bunny Peeps. She will also be using our Cricut Machine for cards and other fun items. Check out the Cricut Facebook page for more fun ideas! We have a new member in our Chess group that meets Monday and Thursday every week from 10am to 3pm. A great way to learn this classic game of strategy that dates back to the 7th century. Our drivers are ready for the summer weather! The drivers here do so much more than deliver fresh hot meals to our community. They are trained in CPR, AED and First Aid. They also do safety checks on everyone they serve. One hot July day we found a client passed out in the heat unresponsive. Quick thinking and training by the driver got her the help she needed. Had she not been on our route, she would not be among us today. These guys are out there every day, rain or shine, serving the needs and safety of the Citizens of Somervell County. 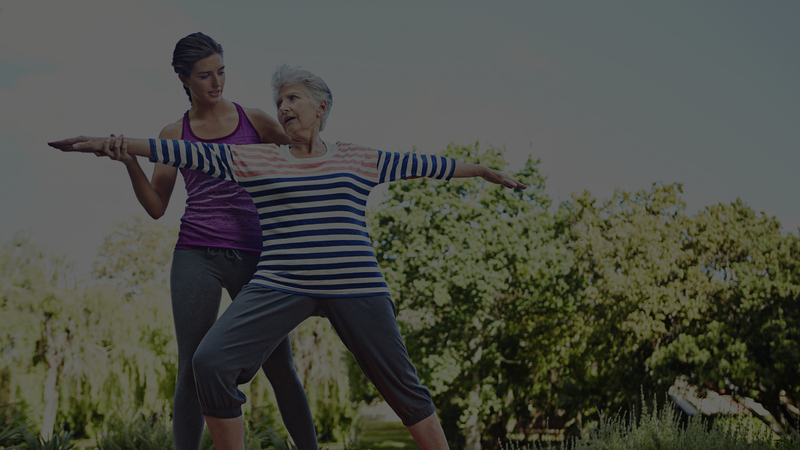 ©2018 Somervell County Commitee on Aging | Site by: KR Designs Co.